I recently mentioned we had been on family vacation with our grandchildren. We had a relaxing stay and a great time watching the kids experience new things. They spent so much time in the ocean and pool that their swimming skills increased by leaps and bounds which really bodes well for cabin and lake time coming up soon here in Minnesota. They loved every minute of the trip. I think what they liked most was the undivided attention from all of us. 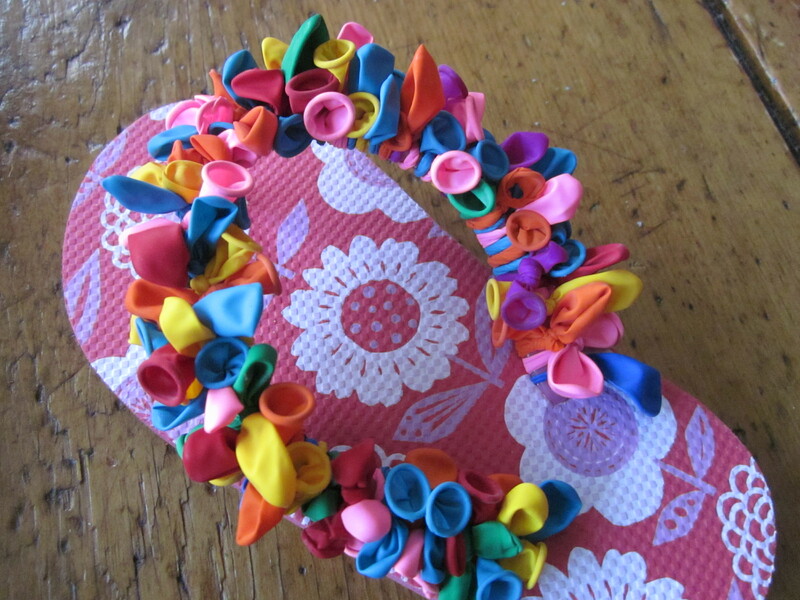 Before we left on vacation, I made Ella some fun balloon flip flops using ordinary small multicolored water balloons and flip flops. This project takes very little time, no instructions…just mindless knot tying while watching a few episodes of Fixer Upper on HGTV, my go to TV show choice. It is also one of my projects that I have received the most raves for, which is a little disturbing considering all of the other very time consuming projects I have undertaken. Most importantly, they are loved and used by our dear little Ella. 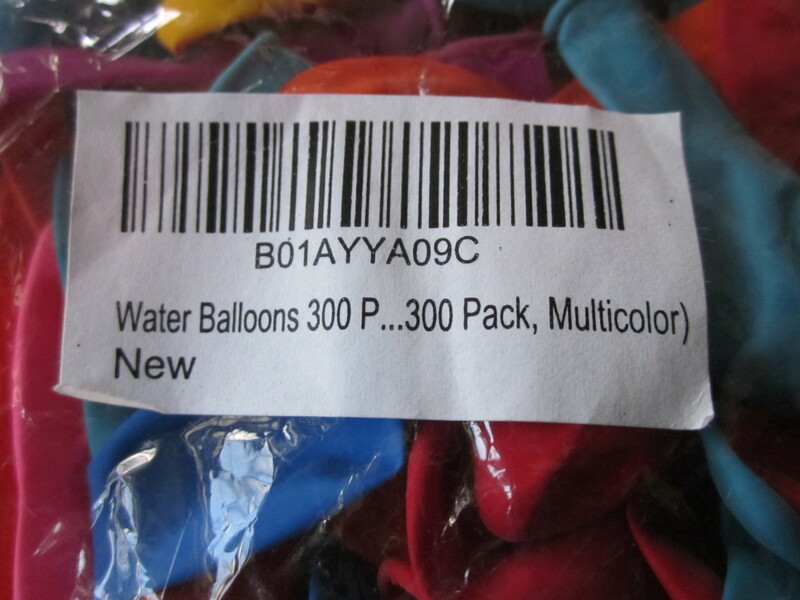 I ordered the balloons from Amazon as I was unable to find water balloons locally. When I had the idea to make these, we still were in snow shovel mode so summer items were not available. However, Amazon had what I needed. I found the flip flops at JoAnn Fabrics. Simply tie balloons while stretching a bit in an overhand knot. Place them nice and close together to create what I refer to as a balloon ruffle. 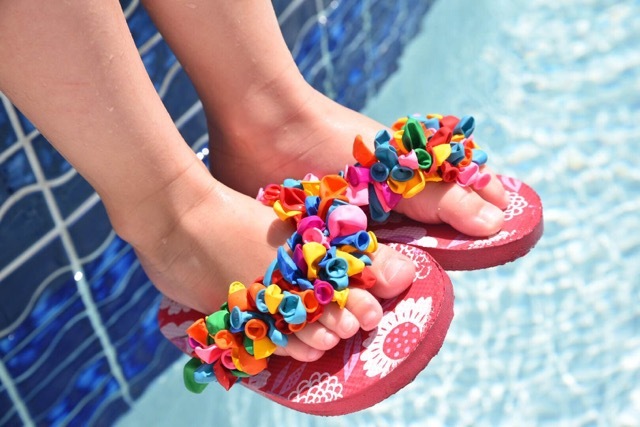 Obviously these are waterproof, easy to wash off if they get muddy, and very inexpensive to make. very cute! 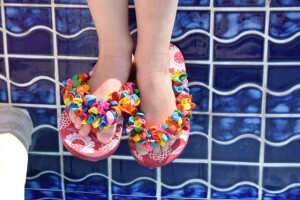 I plan on making these for my Grandchildren. Or possibly a summer poolside crafting with the children from my church. 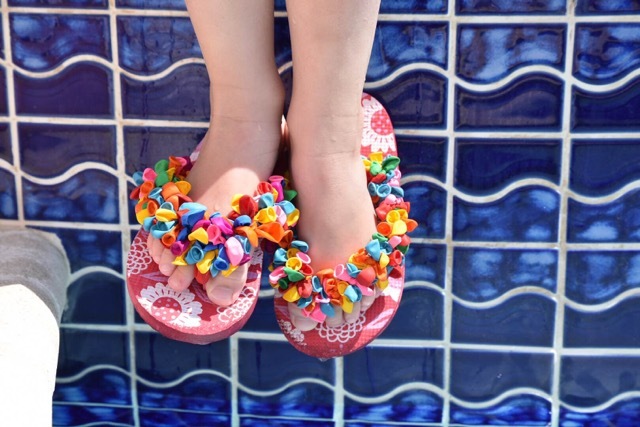 This is such a fun gift to make for little feet. They are the perfect age. Happy travels. I have 2 granddaughters that love doing crafts when they visit. This will definitely be on this summers craft list. They will love them. So cute. Kids love crafts with grandma…I guess it is all about sitting with them and not hustling off to do chores, etc. It is the luxury of being a grand parent. Once awhile back, my grandson called me “Art Grandma” and my husband “Sports Grandpa”…and he was right. 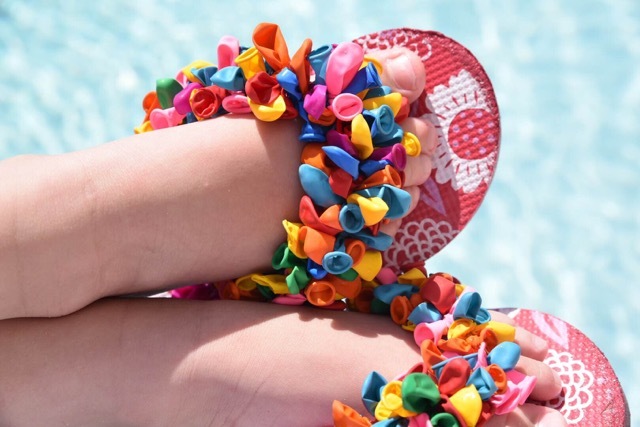 The great thing about these flip flops is that there are no instructions and no right or wrong way to do things if they can at least tie a knot. Once I made a few pair with just a cluster in the center like a pom pom or flower. They were really cute as well. Those are adorable! If I had a granddaughter I’d be all over this, but I have four grandsons. Your mention of getting raves for this project versus all your other projects (which are amazing!) made me laugh. But I just want you to know I have many, many of your books and patterns, and projects from them are all over my house. Thank you! I am sure my grandson thinks these are a real waist of good water balloons. There is nothing he likes more than water balloon fights at the cabin with his dad, mom, grandpa and uncle. Ella is a little too small to be much of any help on his team, but she tries and giggles a lot. Always nice to hear from true Thimbleberries fans. Sorry…waste, not waist. I really need to take the time to read through my responses before sending.